Now entering its second generation, the Chevrolet Cruze is all-new for 2016. After several years of adeptly battling other best-selling compact sedans such as the Honda Civic, Toyota Corolla, Ford Focus and Hyundai Elantra, this latest Cruze builds on a strong foundation. It especially impresses in terms of comfort, technology and value. 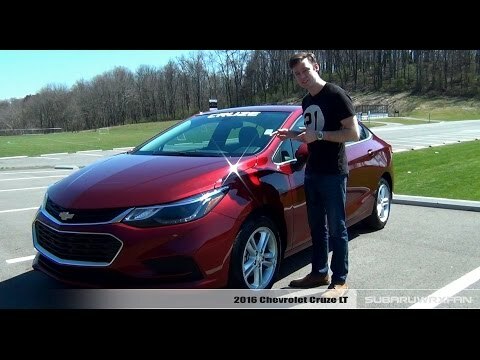 Chevy Cruze review: the right size for me. I really love my Chevy Cruze limited. It is the perfect size for me to maneuver. The trunk looks bigger than it actually is. I was able to fit all of my family’s luggage in the trunk for a family trip. It is a little small on the inside for more than four passengers. However, if all seats are needed it is manageable for short car rides. Many passengers have been confused with operating the seat adjustments. They are not like majority of the other cars. The adjusters are located in spots that people would not generally look for them at. The AUX and charger ports were a small problem for me at first because they didn't work. The SiriusXM stations were very useful during this time. I was able to take my car to the dealer and get new parts installed. The Bluetooth system only works for calls and not for music. It does still have a CD player which is still very useful. I love the different screens I can change to see what is going on with my car. I use the digital speedometer when driving my car instead of the older speedometer. I am able to check the tire pressure and oil level on my car. This has been very useful when detecting if I have a nail in my tire or if I need to go back in for an oil change. I love that there is also a Chevrolet app that allows me to check everything and lock my doors. Overall, I love it and it is comfortable for me. Me & my cruse, get more for the money. Buy American! & save money!! I bought my car new it's really been a good vehicle. It's great on gas mileage, I drove to Daytona beach Fl it's 404 miles one way I filled the tank in Cleveland gab & didn't have to add gas the whole time I was there. I stopped at a friends house in Orlando for 3 days I probably drove 10-15 miles while there before going on to Daytona. I drove up & down the strip probably adding another 10-15 miles, then I drove back to my friends house which was about a50 mile stretch. Anyways I filled the tank in Orlando as I started my trip back and drove all the way back & when I pulled in my driveway I still had almost a 1/4 of a tank left so as far as gas mileage I don't think theres a car out there that gets any better. As comfort I usually have to stop & stretch my legs on a long trip but in my cruse as small as it is I didn't have to take a break I was comfortable. As far as reliable well, it is new and so far it's always ready whenever I have to use it. I haven't been keeping up with how much but I would be willing to bet I have saved enough money at the gas pumps to pay the insurance for a year or more. I have owned a few cars in my life time & I have to say economically the Chevy cruze is at the top of my list. Test out all new features that you have never had in a car before. I love the car, it's a nice color and runs great. One of the things I am not to thrilled about is "auto stop". So when I am driving and get to any kind of stop the car turns off, to save on fuel economy, but during the hot days of the summer if I have the air conditioner on and every time I come to a stop, the car turns off, which in turn turns my air off. So then I have to release the break to get the car to restart to get my air back on. And also being a brand new car when the air can back on it was stinky, not a good smell at all. Kind of a big pain. There is no option that I have found to turn it off. I was told unhooking its battery will always give me an error reading on my computer dash screen and I didn't want that. I tried to remove the fuse that controls the auto stop but it also disabled other features in the car so couldn't do that. During the winter I found out that it does not turn off if its under 40f but in summer has to be over a hundred ( that I have noticed) before it even thinks of not turning the car off. So if this feature had a button to turn it off then it would be a great car. General Motors LLC (GM) is recalling certain model year 2016 Cruze vehicles manufactured November 5, 2015, to May 26, 2016. The headlight assemblies are not marked with a three-digit identifier code used to properly aim the headlights. As such, these vehicles fail to comply with the requirements of Federal Motor Vehicle Safety Standard (FMVSS) No. 108, "Lamps, Reflective Devices, and Assoc. Equipment." Without the identification code, the headlights may be improperly aimed during service, reducing nighttime visibility and increasing the risk of a crash. GM will mail owners instructions and adhesive labels, with the correct code, to install on their headlight assemblies. Owners may also bring the vehicle to a GM dealership for any assistance with applying the label, free of charge. The recall began on August 11, 2016. Owners may contact Chevrolet Customer Service Department at 1-800-222-1020. GM's number for this recall is 50190.